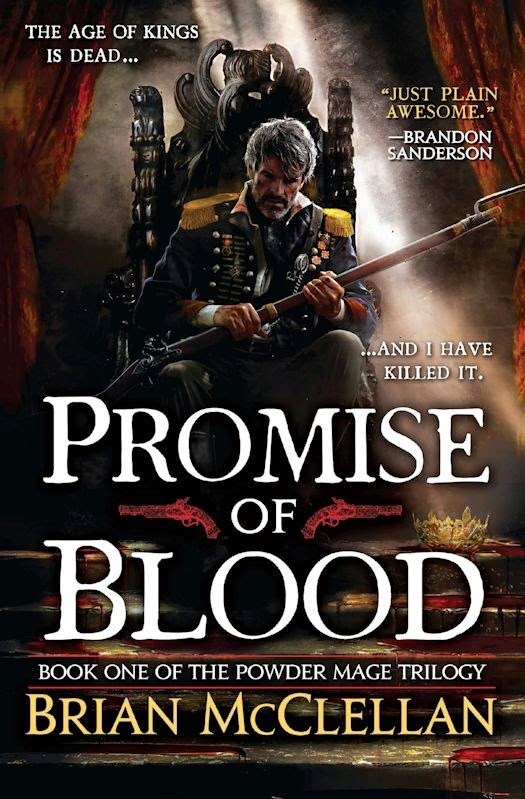 Promise of Blood, by Brian McClellan, is the first in his Powder Mage trilogy, and it seems to be a fairly well-titled series. I’m not sure about the book’s title, but I can definitely appreciate the series’ title. The story features a nation-wide conflict, with international ramifications, and it’s all tied to the significant rise of a new kind of mage. Most mages wear special gloves and manipulate the basic forces of nature. There are some other types of sorcerer, like the “Bone-eye” of some “savage” empire, but they’ve been around for quite awhile, Powder Mages, as the name implies, have their advent closely tied to that of gunpowder and rifles. They can use it, detonate it at will, direct the blast, take strength from it, even sniff it to enhance their senses. It’s one of the more unique magic systems I’ve ever come across. As this ability is understandably potent, it threatens the security of the current powers that be, which have long maintained their position by dominating the community of mystical practitioners. The monarchs hold the sorcerers’ leashes, and so they are kept secure upon their thrones. Powder mages, however, are far more difficult to control, so when one king stupidly squanders all his wealth and effectively sells his nation to a foreign power, it is a powder mage, a high-ranking general named Tamas, who leads a coalition against him. It’s a very quick, very bloody coup, highly reminiscent of the French Revolution, and proves to be only the beginning of a very deep can of worms. Not only does General Tamas have to conquer his nation from within while repelling invasions from without, but the enemy mages he kills utter, after their death, a terrible warning about “Kresimir’s promise.” Kresimir, by the way, is the figure held as a god in this world. These people will definitely have their work cut out for them. Within the weaving of this story were some interesting, powerful themes about politics, class warfare, religion, even divinities, but most of all, human nature. 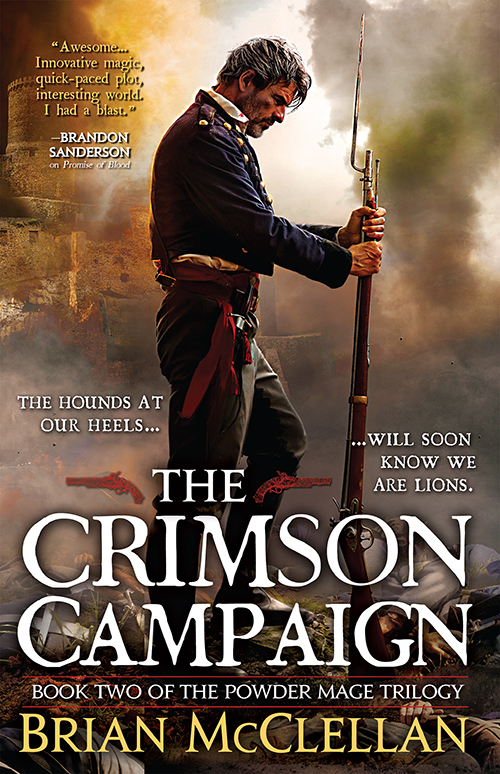 At the start, General Tamas believes that his people, pushed down and stepped on for so long, are hungry for violence and thirsty for blood, so he gives it to them. He gives them so much that he hopes they’ll choke on it, and stop wanting it. But he doesn’t realize the critical error in that. The more blood we spill, as humans, the emptier we become in our souls. The emptier we become, the more blood we seek, until we become ravenous for it. Which can turn against Tamas and his council every bit as easily as he turned it against the nobility. He doesn’t see this because, while he is driven by duty, he is also taking revenge against a hostile nation for killing his beloved wife and her family. He wants blood, and as he gets it, he finds it does not satisfy him. In direct contrast, here comes the cooking god I mentioned earlier. He feeds people actual food, delicious to the taste, filled with nourishment for body and soul. He throws a gigantic feast for the entire city, a massive undertaking that brings all sorts of people together to help out, working and eating and giving, side by side. That fills the holes in their hearts and brings them all together, like a great, big family. This will be in my collection… soon. If I were to find flaws, though, they would definitely be towards the climax, for the most part. We had too much happening, too much left unexplained. When the sorcerers began colliding, I didn’t understand much of what was going on. The last leg of the quest felt like something out of those old movies, King Kong and Sinbad and such, where all these people went into this old, mysterious land filled with dangers, and only the hero came out (there’s a reason I usually dislike that in movies). I didn’t understand how the sorcerers did what they did, so when they collided, I was left wondering what was going on. And how did anyone survive that climax? We don’t know. They were just found and brought home. 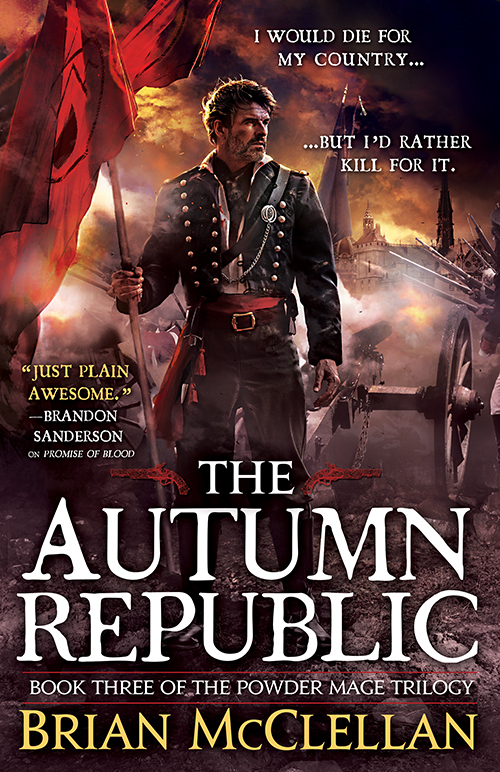 This entry was posted in Books, Tuesday Review and tagged Brian McClellan, Powder Mage, Promise of Blood. Bookmark the permalink.